Day 2 Minecon: 1.9 Update Info! The Future of Minecraft panel starts shortly, and we will be giving you all the info on the 1.9 update right here! Features, links, and more await. Prepare yourselves! Hotkey to swap main/off-hand items (F key by default); outside of combat, this is useful for lighting while mining, drinking potions while fighting/running, etc. I hope that doesn't mean 1.10 and 1.11 will have no new mobs... Or they're starting a new pattern where every update has mobs. Who knows, it's Mojang everybody! I know that Shulkers are getting added for 1.9. I literally said 'mobs' for it. Where are the shaders? Seriously microsoft? Maybe they're going to add shaders in the C+ version. If you're thinking of shaders like in the GLSL Shaders Mod, that's not what's being added(You need a very good computer to run GLSL Shaders Mod). Also this isn't the finished version and Mojang still develops MC, NOT Microsoft. If you're thinking of shaders like in the GLSL Shaders Mod, that's not what's being added(You need a very good computer to run GLSL Shaders). Also this isn't the finished version and Mojang still develops MC, NOT Microsoft. I seriously hope they are upgrading the shader system to GLSL. I fully understand if global illumination shaders aren't included in default, but GLSL is so much more than that and can still give cool effects that aren't so intensive. I'm sure that shaders with effects similar to the ones we have now (or even better) you won't need a "very good computer" to use, and even then shaders are just that-optional. Also, that's seriously short-sighted thinking, like "not many people can run HD packs" as excuse for the simple work it took to make them compatible in default (which they kinda did do that for a while), and now look at how higher-res packs is commonplace and doesn't seem like an unsupported thing. They've already said they're moving away from fixed-function openGL, which I took to mean they were moving into GLSL. The system we have now isn't very good. With full GLSL and some .JSON setup calls we could probably even make resource packs with shaders that run by default, including some that would only work on certain things (like motion-blurred particles, certain blocks with vertex offset, more realistic glass, or actual bloom on certain light sources). I was just clarifying that by shaders it didn't mean that everyone's game would look like SEUS(That's what he seemed to think).I also wrote GLSL shaders instead of GLSL Shaders Mod at one point. I'm not against shaders, if they're more efficient or better in some way(AFAIK they are much better), I'm all for them. What exactly are GLSL shaders though? Are they like the existing shaders applied by Super Secret Settings, or are they a Java Library? What exactly are GLSL shaders though? Are they like the existing shaders applied by Super Secret Settings, or are they a Java Library? AFAIK it would probably be a library once they un-hardcode all of the hack-y bits they used to get it working before. But yeah, the shaders in vanilla in 1.8 are an older (openGL 2.1) extremely limited version of GLSL shaders, because all they could really change was screen output. GLSL (OpenGL Shading Language) was created for making graphical effects easier than direct OpenGL (many games probably use GLSL as a way to achieve certain visual effects). Not just the SUES type stuff is GLSL, but also the , water, Depth of Field, and the bump mapping stuff you may have seen. I'd imagine (and hope) that this would be planned not only so resource packs can change the visuals of the game more, but modders as well (they'd be able to make visual changes on certain things without changing core libraries). When I saw that they were changing to shaders in the 1.9 changelog, I just thought "Cool, that'll be a lot more efficient", now that I understand the full possibilities I really want this. I enjoy modding as a hobby and although the most complex rendering things I have done were just modifications of vanilla code, I look forward to finding ways to use GLSL if it is implemented. Sadly the source of the information about GLSL shaders being added is a tweet by TheMogMiner posted last year, AFAIK TheMogMiner doesn't have anything to do with MC anymore, no one asked modding related questions at the 1.9 update announcement at MineCon and I can't find the more technical discussion the devs did later on. So it might not be added . AFAIK TheMogMiner doesn't have anything to do with MC anymore, no one asked modding related questions at the 1.9 update announcement at MineCon and I can't find the more technical discussion the devs did later on. So it might not be added . The entity model system (also something Mog was doing) seems to be postponed as well, so that kinda destroys my plans of re-releasing my resource pack because that was riding on the possibility that I could use 1.9 features to edit the game at an impressive technical level. All this wait and we get a creepin Clam. 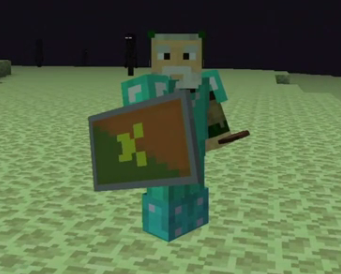 Nice work Mojang. With all your millions of $$, you really put out completely unproportional amounts of content. THE DAMN WAIT IS KILLING ME!!! 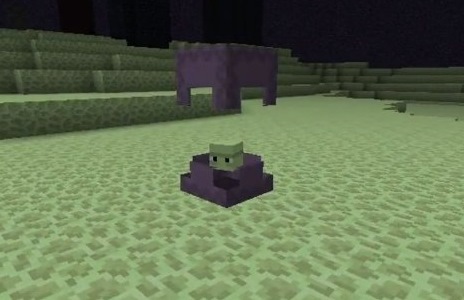 The Shulker looks a little too human to me, maybe make the skin blue or something with spots on top instead of the helmet look and move the eyes a bit or give it four of them. And that block is not much of a disguise as it stands out like a sore thumb, unless that's the open look and the block mimics its surroundings when closed, have to wait and see. Love the new editions to the end. I usually go in, kill a lot of stuff, leave, and never come back. The Shulker must be "Really feeling it!"